Growing up on her family's Sonoma vineyard, Georgia Ford learned some important secrets. The secret number of grapes it takes to make a bottle of wine: eight hundred. The secret ingredient in her mother's lasagna: chocolate. The secret behind ending a fight: hold hands. But just a week before her wedding, thirty-year-old Georgia discovers her beloved fianc has been keeping a secret so explosive, it will change their lives forever. Bestselling author Laura Dave has been dubbed "a wry observer of modern love" (USA TODAY), a "decadent storyteller" (Marie Claire), and "compulsively readable" (Woman's Day). 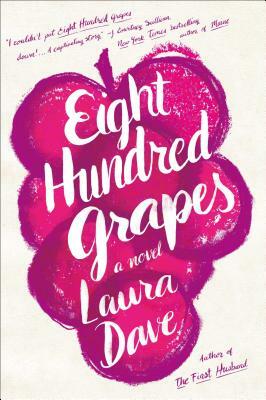 Set in the lush backdrop of Sonoma's wine country, Eight Hundred Grapes is a heartbreaking, funny, and deeply evocative novel about love, marriage, family, wine, and the treacherous terrain in which they all intersect. In this breakout novel from an author who "positively shines with wisdom and intelligence" (Jonathan Tropper, This Is Where I leave You), Laura Dave "writes with humor and insight about relationships in all their complexity, whether she's describing siblings or fianc's or a couple long-married. Eight Hundred Grapes is a captivating story about the power of family, the limitations of love, and what becomes of a life's work" (J. Courtney Sullivan, Maine).